The world of IT is undergoing a digital transformation. Applications are growing fast, and so are the users consuming them. These applications are everywhere—in the datacenter, on virtual and/or microservices platforms, in the cloud, and as SaaS. More and more apps are now being moved out of datacenters to a cloud-based infrastructure. In order for an optimized and secure delivery of these applications, IT needs specific network appliances called Application Delivery Controllers (ADCs). These ADCs come in hardware, virtual, and containerized form factors, and are sized by Network Administrators based on the current and future usage of applications. The challenge with this is that it’s hard to foresee sizing or scalability requirements for these ADCs since users are constantly increasing, and applications are consistently evolving, as well as moving out of datacenters. Complicating matters, most ADCs are fixed-capacity network appliances that provide zero or minimum expansion capability beyond their original capacity, so customers needing greater ADC capacity in the future have traditionally had to invest all their money on Day 0. Another option is to perform upgrades and install new appliances, but this process is very expensive, time consuming, and highly disruptive. Neither alternative is any better. Proactively overprovisioning consumes scarce capital budget, increases on-going support costs, and often results in substantial unused capacity. These issues create the need for your ADC to enable true multi-dimensional scaling to dynamically manage your application delivery infrastructure end-to-end, and maximize your ADC investment. 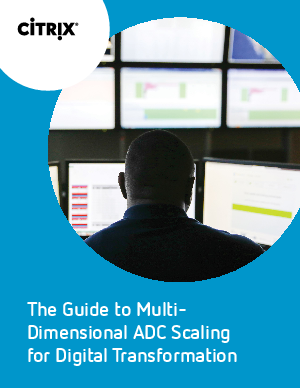 This eBook will explain what multi-dimensional ADC scaling is, its key use cases, and the considerations your organization should make when selecting a solution to support multi-dimensional ADC scaling in the face of digital transformation.